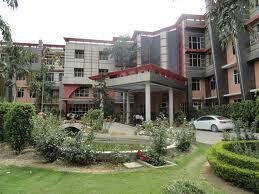 IIMT Group of Colleges has four distinct campuses at different locations. While three of them are located in Meerut : Two at Mawana Road Meerut, One at Mall Road Meerut, and the fourth one is situated at Greater Noida. Each campus is well laid out in pollution free area with aesthetically planned landscape providing environment conducive to professional studies with ample facilities such as Lecture Halls, Conference Halls, Video Conferencing, Multi-media Projectors, and well stocked Libraries etc. to prepare the students to boldly face the challenges ahead in the Industries as also in the Society. The students living in the hostels have been provided with well set rooms, neat and clean dining halls, well equipped gymnasium and sports facilities, banking and communication facilities together with paramount importance to their security and a student friendly approach. Campus: IIMT Group of Colleges has four distinct campuses at different locations. While three of them are located in Meerut : Two at Mawana Road Meerut, One at Mall Road Meerut, and the fourth one is situated at Greater Noida. Each campus is well laid out in pollution free area with aesthetically planned landscape providing environment conducive to professional studies with ample facilities such as Lecture Halls, Conference Halls, Video Conferencing, Multi-media Projectors, and well stocked Libraries etc. to prepare the students to boldly face the challenges ahead in the Industries as also in the Society. The students living in the hostels have been provided with well set rooms, neat and clean dining halls, well equipped gymnasium and sports facilities, banking and communication facilities together with paramount importance to their security and a student friendly approach. Central library: A well stocked library is the backbone of any academic institution. As good friends are rare to find so are good books. The library plays a very important role and shares its commitment to excellence of the institute. It is committed to offer rapid response with greater flexibility to groom the students as also the faculty community. Each college of IIMT has its own library in a spacious hall and reading room. The libraries of IIMT have a total stock of approximately 2,00,000 publications and more than 500 National and International Journals in Management, Engineering, Hotel Management, Law, Education and Pharmacy etc. The library also contains rich collection of assorted material on general awareness. The institute is also the member of DELNET, EDUSET and INDEST which provide ready access to libraries of leading institutions of the world. Librarians are relentlessly engaged in continuously augmenting our International Journals Resource Base by having EBSCO which allows access to over 4000 International Journals of repute. Hostel:Though away from home yet IIMT boarding facilities make it a sweet home. Boarding facilities at IIMT for students of residential programs consist of eight hostels available for boys and girls separately. The institutes have self contained hostels with more than 1200 rooms in total having the capacity of 2,500 students on twin-sharing basis. Other facilities include excellent dining halls, indoor games, exercising equipments, communication centre with internet facility and sports fields for outdoor games. Rooms are spacious, hygienic, well-ventilated and fully furnished for its residents. Delicious and nutritious meals are served in hostel dining halls in hygienic environment. The green lawns in the campus always freshen up the hos tellers besides being main attraction for those who love nature. Twenty Four hours water and electricity supply is available.